balcony. Tiled Kitchen/Dining area and large bedrooms. 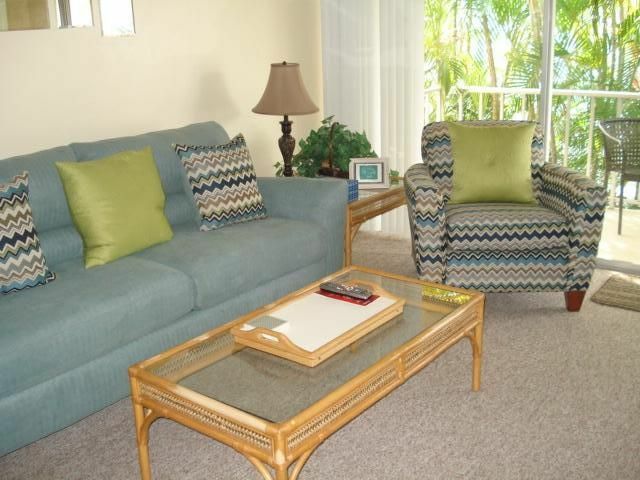 Enjoy a day by the heated community pool or walk miles of Sarasota's soft sand beaches. Centrally located you will find ease in visiting any local attraction. Hi there - I'm Lana, property owner and manager of this beautiful condo. I take pride in making sure my guests are well taken care of during their stay with a clean, well kept and properly functioning home. Please ask any questions you may have regarding this charming home. I am here to assist in any way I can! This very clean and fully equipped condo has it all! Bring nothing but your toothbrush and suitcase. You will find this condo has all the things you need at your fingertips including a lot of "extras". Enjoy the heated community pool just steps from the condo. This particular property is one of my favorites! With its close proximity to the beach you will have no troubles finding something to do whether it be boating, fishing, shark tooth hunting, shell finding, kayaking or if you chose, take the beach umbrellas, cooler and beach chairs, provided for you, and just chill at sunset or walk miles and miles of sugar sand beach. Drive or Bike to beach approximately one mile and a half away!! Central Heat and Air, Brand new Flat Screen TVs in Master bedroom and Living Room, Cable provided, Landline, WI-FI, Nicely Equipped Kitchen, Coffee Maker, Microwave, Dishwasher, Refrigerator, Cooking Utensils provided, Linens provided, Washer & Dryers on Property, Pool, Pets NOT allowed, sorry, no smoking. Complimentary Beach Chairs, towels and umbrellas are provided for guests. Excellent customer service - Lana's integrity shines throughout every area in her condo and her service! It is very clean and well maintained. The 2 of us gals were very comfortable and found that the place was fully stocked with all our needs, more than we even realized, from super high quality bed mattresses and on down to the complimentary bottled water in the fridge. We didn't want to leave! We were so very pleased and would definitely stay there again including any place she manages! Thank you. There were 3 of us and we had a lovely stay. The condo is very clean, quiet and well-decorated - just like you see in the photos. The rooms are a good size and the kitchen had everything we needed. We didn't use the pool because the beach is a quick drive from the condo. The communication with Lana was great as well. Hope to return next time we are in Florida! Awesome stay in Sarasota, FL!! We found the unit to be exactly as described on-line, very clean. Visited Siesta Key Beach everyday! Was able to relax at the condo's pool after our trips to the beach. Pool was extremely quiet and very relaxing. The unit had everything we needed during our stay, beds were comfortable. Thank you, Lana for your quick responses and taking care of our accommodations. You were very helpful in your recommendations since this was our first visit to Sarasota. We will be re-visiting! Nice comfortable condo. Very comfortable. Any issues we had were taken care of immediately. Quiet, friendly neighbors. Safe area and easily accessible to many restraunts and shopping. My husband and I needed a short term rental while we purchased a home and this was perfect! Lana was so very accommodating the condo had everything we needed and was close to everything! we used the beach chairs provided to watch the sunset on siesta beach. A M A I S SI N G !! Couldn't have been more perfect for us. The location we wanted with very reasonable rates. The owner was very accomadating to all our needs and the condo was just as pictured. Hopefully can be repeat guests. Snorkeling/Diving, Boating, Sailing, Water-Skiing, Kayaking, Stand-up Paddle Board, Surfing, Windsurfing, Parasailing, Sunsets, Jet-skiing, Shelling, Nature trails with biking and hiking and more!